In the late twenties a young American artist and Cezanne enthusiast by the name of Erle Loran moved into Cezanne’s studio. For two years Erle wandered the countryside around Aix-en-Provence and photographed the scenes that the deceased artist had painted. The result was a remarkable and intelligent book. Cezanne’s Composition, now only in paperback, is a clear-headed artist’s analysis of what he thought was going on in Cezanne’s mind, and more importantly what was going on in his pictures. Two things have always struck me about Erle’s photos vis-a-vis Cezanne’s paintings. First, there’s the ordinariness of the subjects themselves — pedestrian views, buildings, quarries, farms — the relative formlessness of Mont Sainte Victoire which he painted many times. Second, the paintings’ closeness to actuality. We are looking at an artist who was trying to get it right. Then we compare the interest of Cezanne’s surfaces, their limitations, their mannerisms. We look at the wooden color, deadly blacks, tentative search for line, struggling volumes, eye-control devices, absence of aerial perspective, and the characteristic fidgets. Cezanne, it seems to me, was an artist who was conscious of his shortcomings. “It is for me to only show the way,” he said in a depressed moment. He took a long time with his paintings, like an amateur. While few would admit it, he worked within the safety and conservatism that his style permitted, and it was his style that won — a unique fidget carried from canvas to canvas and in a million modifications into the studios of the world. Esoterica: I was in Cezanne’s studio in the suburbs of Aix. His coat and hat hung near the door — as if he was still somewhere around. Paint spotted the floor — like my studio and perhaps yours. The window glass had that uneven surface one sees in old windows — through it the orchard, the white buildings and tiled roofs of Aix were broken into little swatches of color — like a Cezanne. Could it be? You have obviously taken a careful look at the popular analysis of Cezanne’s work. The simplest solution prevails. Thanks for this. It’s as clear and practical an understanding of his process as I have seen. We artists tend to see these sorts of things. People who write a lot of balony about art — often don’t. I find it difficult that you would reduce Cezanne’s ground-breaking style to a simple “fidget.” He was the one who spiritually brought the picture plane forward and built strength and composition out of the magnificence of line. You are right though when you say his unique touch has been transmitted to the studios of the world. 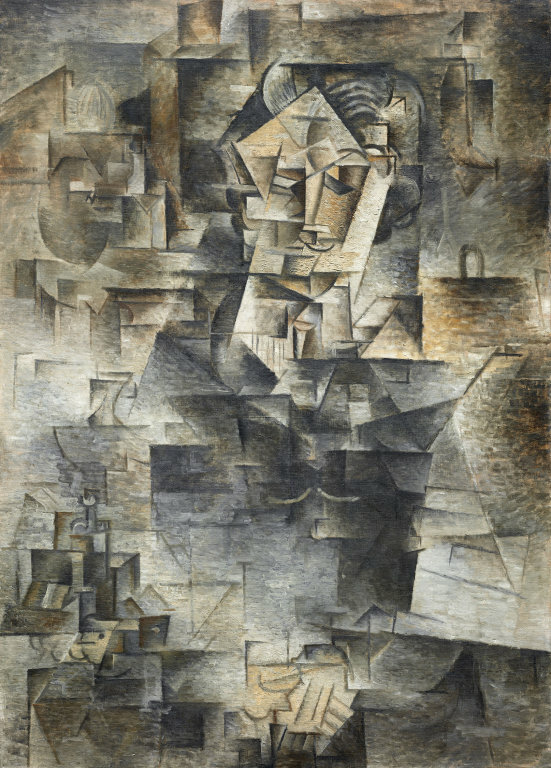 Look at Picasso’s Portrait of Kahnweiler which followed shortly afterward. “The transposition that a painter makes with an original vision gives to the representation of nature a new interest; he unfolds, as a painter, that which has not yet been said; he translates it into absolute terms of painting — something other than reality. (RG note) Thanks for those, Albert. This gives me an opportunity to encourage artists and researchers to go to the expanding Resource of Art Quotations. Associate editors have been doing original research and finding excellent material that has not been commonly seen before. It’s well worth a look — and it’s constantly getting better. Erle Loran photographing Cezanne’s scenes brings to mind the constant challenge we photographer-artists have. We take the mundane, ordinary and boring, and transform them into something unique, special, and interesting. We do this by spending a lot of time looking, understanding that most things we see has potential given the right light, circumstance and interpretation. I have had this principle demonstrated many times while individually teaching some of the advance students I take on. I often take him or her into my backyard, and direct him or her to find enough interesting material in a 3 yard radius to fill a roll of film. Usually, I get looks as if I have lost it — my backyard is a typical not-well-cared-for suburbia type that at first glance looks pretty ordinary. After being convinced that the assignment is in earnest, he or she will start to look and begin to see interesting moments. Usually, this is not a difficult task to complete once started, and some of these more earnest students produce some remarkably interesting prints from this simple exercise. I do it myself when stuck somewhere and have the urge to produce. Your remarks on Cezanne bring the realization that I have always had that the subject matter is really not important. Buildings, trees, fields, mountains are just the excuse. The main thing is the desire to work within one’s limitations to the best of one’s ability and with the feeling that perhaps you might have something unique to offer. This is what kept Cezanne going. Some might say it was all he really had. 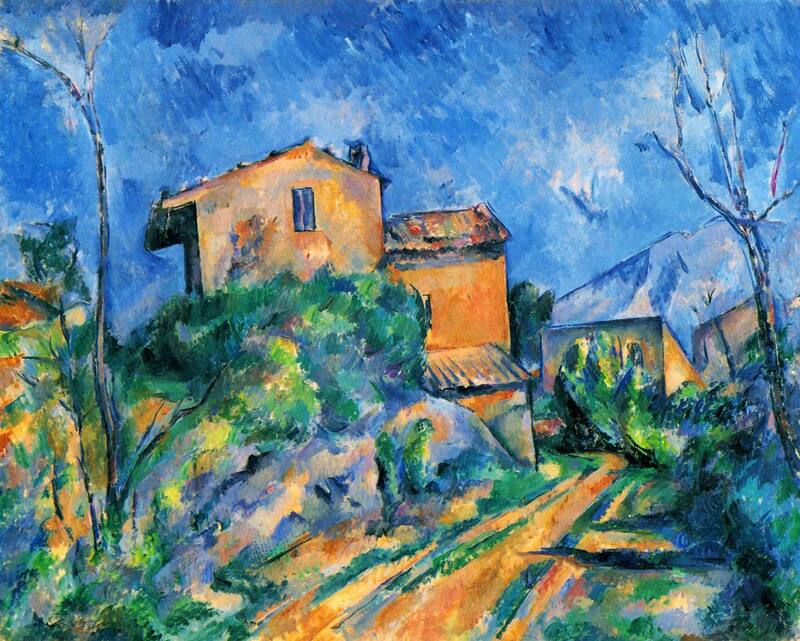 Cezanne referred to his subject matter as “motifs.” He was not copying nature. He was doing something with it. It could well have been that Cezanne was aware of his limitations and worked within a safety margin so as not to expose his lack of capabilities. If this argument holds, then the man was a genius. While languishing in fixations and depressions (be they real or self-induced) he produced many ‘wooden’ paintings which today sell for large sums of money. I visited Aix-en-Provence a couple of years ago, and my biggest disappointment was not finding a single original Cezanne in the town. The studio visit was certainly inspiring, but a nice museum filled with Cezanne originals would have been really divine. Perhaps I didn’t visit the right places? (RG note) It’s hard to find. The Granet Museum in Place Saint-Jean de Malte, Aix, was founded in 1831 in the old drawing school. As a boy Cezanne admired paintings there by Pierre Puget, Dubufe and Frillie. Later he copied from these masters. A sculptor by the name of Auguste-Henri Pontier took over the museum in 1892 and stayed on the job until 1925. He swore that not one work of Cezanne would enter the museum during his lifetime — and he kept his word. Today the rules have changed and you can see about 18 Cezannes at any one time. Thinking of an art school? Look at the Art Center College of Design, (Pasadena, Calif.) go to contents. This one takes a while. Informative material on the life and works of Paul Cezanne.